One of my favorite things about fall is sweater weather. I don't mind spending some extra funds on a staple sweater I can live in all season long. When I saw the price tag on this sweater, I was shocked. The sweater is super soft, while sporting a chunky knit. It's the type of sweater you expect to see at the $50 - $100 range, but its only $19.99! The color I'm wearing is sold out online, but it is still available in stores. It also comes in a pretty mint color and black. It looks really nice paired with a long white button up thrown underneath, which will elongate the whole look. I am a huge fan of all the camo going on this season. These are a cross between a wedge bootie and a sneaker. They are comfortable yet nice enough to wear from day to night. The booties come in nine different colors and are linked below along with the sweater! I'll be the first to admit that casual wear has conquered my closet over the last two years. Now that I'm feeling like myself again and have that pre pregnancy body back (just in time to get pregnant again) I'm getting back into the dress and skirt game. 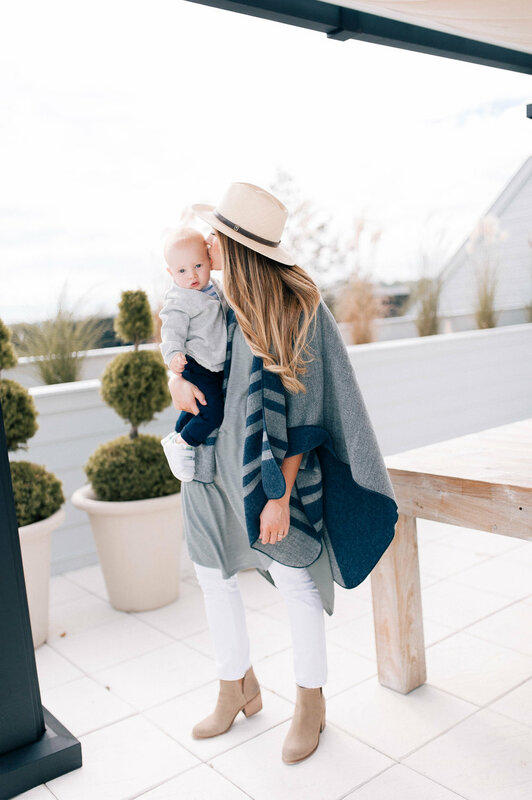 Feeling cozy yet still looking put together is the balance I strive for as a new mom. This super soft rib pullover with subtle bell sleeves paired with this flirty velvet skirt accomplishes that polished look, yet comfortable feel. For a nicer night out try pairing the skirt with a silk top and a pair of OTK boots with a heel. The skirt runs small, as you can see. I had to throw in the last picture, such a classic mom moment. I remember the exact words going through my head, "I gave birth to you, don't you dare take off that hat."